This week finds the collective domestic oil industry wringing its hands about the latest in a series of serious oil transport train casualties. This time, on Monday, the news involved a crude-carrying train that derailed in West Virginia, complete with more than one dozen tank cars afire and necessitating the evacuation of nearby towns. Just before that, another train in Canada consisting of about 100 tank cars carrying crude oil derailed in remote Ontario and suffered a similar fate. Both events naturally caught the attention of environmental and safety activists and oil industry analysts. Also this week, Reuters analyst John Kemp penned a column that chronicled the “high-stakes risks” that the use of rail for crude oil transport represents. First lamenting the 591 (now 593) days that have passed since a train high profile crude train derailed and devastated a small town in Quebec, Kemp also correctly points out that in that time, the U.S. Department of Transportation (DOT) has failed to finalize new safety rules for tank cars and operational standards for trains carrying flammable liquids. And yet, what we see here is nothing new for the domestic waterfront. Frankly, it is just a familiar way of life. 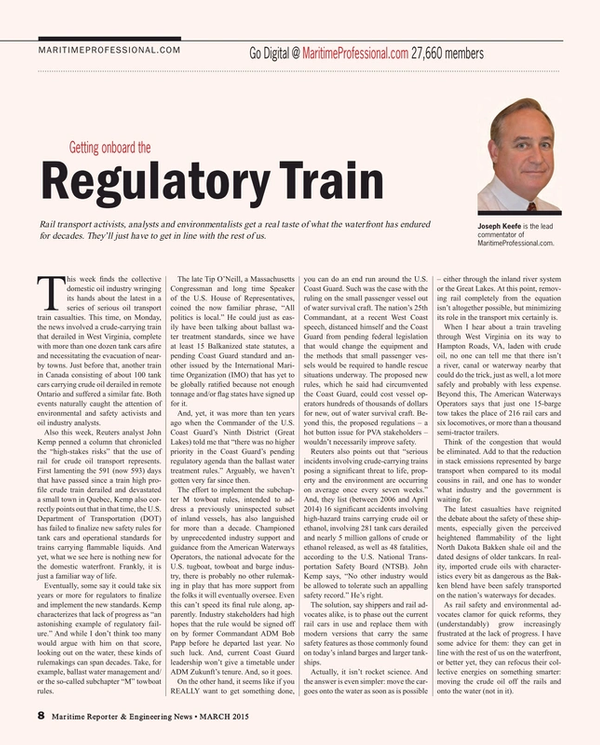 Eventually, some say it could take six years or more for regulators to finalize and implement the new standards. Kemp characterizes that lack of progress as “an astonishing example of regulatory failure.” And while I don’t think too many would argue with him on that score, looking out on the water, these kinds of rulemakings can span decades. Take, for example, ballast water management and/or the so-called subchapter “M” towboat rules. The late Tip O’Neill, a Massachusetts Congressman and long time Speaker of the U.S. House of Representatives, coined the now familiar phrase, “All politics is local.” He could just as easily have been talking about ballast water treatment standards, since we have at least 15 Balkanized state statutes, a pending Coast Guard standard and another issued by the International Maritime Organization (IMO) that has yet to be globally ratified because not enough tonnage and/or flag states have signed up for it. And, yet, it was more than ten years ago when the Commander of the U.S. Coast Guard’s Ninth District (Great Lakes) told me that “there was no higher priority in the Coast Guard’s pending regulatory agenda than the ballast water treatment rules.” Arguably, we haven’t gotten very far since then. The effort to implement the subchapter M towboat rules, intended to address a previously uninspected subset of inland vessels, has also languished for more than a decade. Championed by unprecedented industry support and guidance from the American Waterways Operators, the national advocate for the U.S. tugboat, towboat and barge industry, there is probably no other rulemaking in play that has more support from the folks it will eventually oversee. Even this can’t speed its final rule along, apparently. Industry stakeholders had high hopes that the rule would be signed off on by former Commandant ADM Bob Papp before he departed last year. No such luck. And, current Coast Guard leadership won’t give a timetable under ADM Zukunft’s tenure. And, so it goes. On the other hand, it seems like if you REALLY want to get something done, you can do an end run around the U.S. Coast Guard. Such was the case with the ruling on the small passenger vessel out of water survival craft. The nation’s 25th Commandant, at a recent West Coast speech, distanced himself and the Coast Guard from pending federal legislation that would change the equipment and the methods that small passenger vessels would be required to handle rescue situations underway. The proposed new rules, which he said had circumvented the Coast Guard, could cost vessel operators hundreds of thousands of dollars for new, out of water survival craft. Beyond this, the proposed regulations – a hot button issue for PVA stakeholders – wouldn’t necessarily improve safety. Reuters also points out that “serious incidents involving crude-carrying trains posing a significant threat to life, property and the environment are occurring on average once every seven weeks.” And, they list (between 2006 and April 2014) 16 significant accidents involving high-hazard trains carrying crude oil or ethanol, involving 281 tank cars derailed and nearly 5 million gallons of crude or ethanol released, as well as 48 fatalities, according to the U.S. National Transportation Safety Board (NTSB). John Kemp says, “No other industry would be allowed to tolerate such an appalling safety record.” He’s right. The solution, say shippers and rail advocates alike, is to phase out the current rail cars in use and replace them with modern versions that carry the same safety features as those commonly found on today’s inland barges and larger tankships. Actually, it isn’t rocket science. And the answer is even simpler: move the cargoes onto the water as soon as is possible – either through the inland river system or the Great Lakes. At this point, removing rail completely from the equation isn’t altogether possible, but minimizing its role in the transport mix certainly is. When I hear about a train traveling through West Virginia on its way to Hampton Roads, VA, laden with crude oil, no one can tell me that there isn’t a river, canal or waterway nearby that could do the trick, just as well, a lot more safely and probably with less expense. Beyond this, The American Waterways Operators says that just one 15-barge tow takes the place of 216 rail cars and six locomotives, or more than a thousand semi-tractor trailers. Think of the congestion that would be eliminated. Add to that the reduction in stack emissions represented by barge transport when compared to its modal cousins in rail, and one has to wonder what industry and the government is waiting for. The latest casualties have reignited the debate about the safety of these shipments, especially given the perceived heightened flammability of the light North Dakota Bakken shale oil and the dated designs of older tankcars. In reality, imported crude oils with characteristics every bit as dangerous as the Bakken blend have been safely transported on the nation’s waterways for decades. As rail safety and environmental advocates clamor for quick reforms, they (understandably) grow increasingly frustrated at the lack of progress. I have some advice for them: they can get in line with the rest of us on the waterfront, or better yet, they can refocus their collective energies on something smarter: moving the crude oil off the rails and onto the water (not in it).